Two decades after the fall of the Soviet Union in 1991, modernization is the watchword in Russia—with science as a vital means to that end. 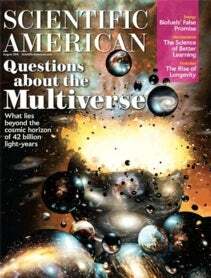 * During the spring meeting of the 14 international editions of Scientific American, we gathered in Moscow, and our hosts introduced us to many of the surrounding issues. Scientific American has had a long history in this country, where it has been available in translation for 28 years. The edition’s head, Sergei Kapitza, is a beloved researcher, science popularizer and TV personality—the Carl Sagan of Russia. When the Soviet system unraveled, however, science took a backseat to other domestic matters. Researchers lost funding and social status, crippling the former science powerhouse. Up to 35,000 scientists emigrated—a loss that the government is now trying to rectify with targeted programs. The state-owned venture capital company Russian Corporation of Nanotechnologies, or Rusnano, will spend some 318 billion rubles (around $11 billion) in public-private partnerships aimed at creating a self-sustaining nanotech industry by 2015. (Today Russia’s nanotech products account for just 2 percent of the global market.) “Our role is to build this bridge [between science and business] and to start up the Russian nanotechnology industry,” Anatoly Chubais, CEO of Rusnano, told the Scientific American visitors. Of some 2,000 applicants, Rusnano has so far chosen to help fund 111 companies to build manufacturing facilities. In an initiative to entice expatriates and foreign scientists to conduct basic research in Russia, the government recently set up a system of “mega grants” totaling 12 billion rubles (about $433 million). The money will help, but Russian science still suffers from the challenges of low pay and stifling bureaucracy, as Vladimir E. Fortov, academician of the Russian Academy of Sciences, explained to me. Scientists need to fill out multiple forms to get basic tools, hindering progress, and technology transfer is difficult. Despite the problems, Russia has rightly realized that future prosperity will come from fostering science in the present, and it is devoting significant funds toward that goal. It is a lesson that the budget-sensitive U.S., which has long benefited from earlier investment in basic research, should reflect on as well. *Correction (7/21/11): This sentence was edited after posting to correct an error that appeared in the print edition.